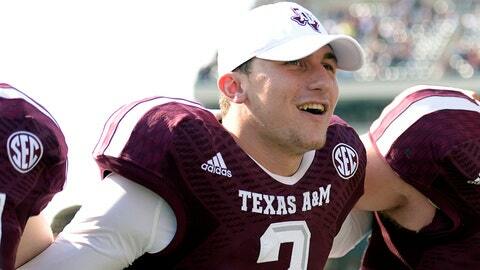 Most people expected Texas A&M quarterback Johnny Manziel to declare for the NFL Draft, and he did so on Wednesday. So that’s out the way, but what now? Well, the real fun starts. Where will Johnny Football land on the next level? Let’s break down the best NFL landing spots for him. Minnesota is in the market for a new coach and likely a new QB. They have explosive pieces on offense outside of Adrian Peterson. Even if Manziel struggles early, the Vikings could lean on Peterson and a QB who can execute the zone-read to throw less and get the ball in Peterson’s hands more. Wide receiver/kick returner Cordarrelle Patterson has turned into one of the most explosive players in the NFL, and Manziel would flourish with defenses focused on AP and Patterson. Plus, as the Vikings move outdoors for two seasons while their new stadium gets built, why not go with a guy whom people have compared to Fran Tarkenton? The Browns need a QB and have two first-round picks (No. 26 from Indy). Josh Gordon is one of the best wideouts in the game, but Cleveland has problems protecting the passer. They need a QB who can create space on his own and has the creativity to get the ball to Gordon in several different ways. General manager Michael Lombardi is a Bill Belichick disciple, and there is a history of his guys taking a chance on QBs in the first round (Josh McDaniels took Tim Tebow with Denver). Has there been a QB to come into the draft who was a more perfect fit for an organization? Manziel and everything he has been through in three years at Texas A&M screams Oakland. Not to mention they need to create some buzz, and Manziel has a following and fame that is unrivaled. Head coach Dennis Allen does not have the answer with Matt McGloin or Terrelle Pryor, and they have to find a solution for running back Darren McFadden’s health situation. Manziel could take hits away from McFadden and revitalize the organization. Carson Palmer has been a great stop-gap for Bruce Arians and the Cardinals. The NFC West is no joke with Seattle and San Francisco, plus St. Louis has great pass rushers and two first-round picks, including No. 2 overall. With three good defenses in one division, Arizona has to find a long-term quarterback. The Cardinals’ defense is as good as advertised, and Tyrann Mathieu, should he return healthy next year, may have helped ease the organization’s fear of taking players who have off-field issues. It may be a wild card, but if Manziel is still on the board, it would be a smart pick, plus he could learn behind Palmer for at least a year. Jacksonville could use Manziel, but the Jags could use anyone, really. Much of Oakland’s reasoning applies here: a disheartened fan base, poor attendance and no answer at quarterback. This is not as good of a fit because the team’s defense needs help, and there are going to be some great defensive players on the board. Also, if they go with a quarterback, Blake Bortles from UCF might be a better fit. If he impresses in the next two months, he could land in Jacksonville. Manziel would be sitting pretty with picks Nos. 4, 5 and 8 coming up in the form of Cleveland, Oakland and Minnesota.